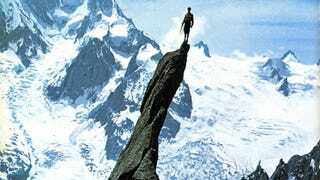 You're looking at alpinist Gaston Rébuffat standing proud on the Aiguille de Roc, a striking needle rock in the Alps, near Chamonix, France. It's an outstanding image—one that aliens from another solar system or galaxy may see one day. How, you ask? It's in Voyager's Golden Record—along with all the images below. Impressive, right? And this was in the 1950s, when alpinists didn't have any advanced gear. Not even Gore-Tex. It also had these letters, because we all know that aliens talk in English. It says so in the movies.